Last month I picked a low profile N64 game as the game of the month and now I'm picking a Playstation game I feel didn't get a lot of hype or respect. For those of you who didn't know, Nectaris was a war/strategy game created by Hudson of Japan and released here by Jaleco exclusively for the Playstation. It's also known as Military Madness for all you old school Turbografx fans out there. The name Nectaris was the Japanese name for the game and Military Madness was the North American name. Jaleco decided to combine the two names to avoid any more confusion. Now that’s out of way here is why Nectaris is such an underrated strategy game. So what do you do in Nectaris? You command a small moon army called the Union (blue) and you're up against the more powerful and much larger Xenon army in a fight for control of the moon. If you lose; the Xenon (green) army will complete their top secret weapon S.A.M. (Supreme Air Missile) and destroy the earth with it. You have no choice but to resist and fight the Xenon Army before it's too late. Can you out think your enemy enough to survive all 16 levels? If not the earth as we know it is doomed. What makes Nectaris so unique when compared to other war simulations is that game plays a lot like a board game than an average real time strategy game like a Star Craft, a Herzog Zwei, or a Dune. First the game starts off with each side getting so many units like soldiers, tanks, indirect gunners, and aircrafts you get to move each unit once before you have to end your turn, than its Xenon turn to strike back (which can be very hard to watch by the way). Each set of units comes with a team of 8 and if all 8 members of your team are completely destroyed then that unit will be removed from the main map. There are over 20 different units to find to in the game and each has its own strengths and weaknesses. 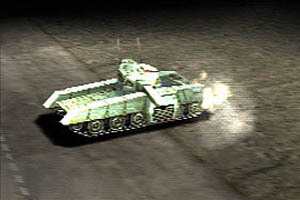 Take the Rabbit doom buggies for example; these little vehicles are extremely quick (so quick that they can even move after a battle), plus they have powerful ground missiles and even light air guns so these little buggies can pack quite a punch but they also have weak defense to be careful of. Some units like the Polar and the Bison can't even attack air units while other units like the Trigger and the Pelican can't even attack at all. Although ground soldiers are the weakest units in the game, they are also the only units that can capture an enemy base (for the instant win) or a neutral factory so it's a good idea to keep them alive. There are two ways to win in Nectaris, first you can try and destroy every single Xenon unit there is on the level to score a complete victory of that area or secondly, like I said earlier, you try and get your lowly ground soldiers to take over the head base to force surrender. Sneaky but it works! You're going to need all the tactics you can get because the Xenon army usually has the advantage with more units per level when you start a mission, but there are also neutral yellow factories that carry more units to gain more of an advantage. The computer can also grab these factories too and some factories are better than others because they may contain more units. You can use your factories if one of your units loses too many lives, simply store weaken units into a factory to refill them back to a full 8 per unit but be aware that your unit will lose its turn. The really cool thing about Nectaris: Military Madness is the RPG elements thrown into the mix. If you look closely, each unit team can get experience after a fight or factory takeover. This can increase firepower and add defense to help gain an edge. Terrain can also affect game play and strategy by increasing unit defenses or by limiting the range of mobility like in a rocky area on a map that affects ground units while air units don't have to worry about this at all. It's also cool to a 'gang up' technique on your enemy. This is known as the 'Zone Of Control' effect. Using Z.O.C. just right can cut an opponents point stats in half and this can even increase your attack power just by having friendly units near before you into battle. Fights can be very unpredictable if you don't use Z.O.C.! The Playstation version features more of what I love. The main campaign not only features 16 new missions with new maps, you can also try out the original Turbografx-16 levels after you complete the main game. The game even lets you play their reserved worlds so you can as the Xexon team so in total you get a massive 64 levels. It doesn't even end there folks. Hudson was even kind enough to include 44 bonus mini missions made by contest winners in Japan. Altogether that's over a 100 levels altogether and I'm not even counting the ones you can make own thanks to the edit mode. Sadly anybody looking for major improvements over the TurboGrafx-16 is going to be in for a disappointment. There are no game play improvements because all of the rules are the same plus there are no new tanks, new aircrafts, no new units what so ever. Still that doesn't take away just how great the game is, plus this game should eat up a lot of your time because of all the new levels and various goodies to unlock. Though the game play maybe very similar, at least there are all new 3D battle scenes (which can be turned off or on for zero loading times) that show off the powers of the Playstation and the fight scenes look better than ever thanks to the awesome explosions and realistic characters. They should be turned on ever once in awhile. The in game map graphics are also much sharper than the original Military Madness thanks to the rendered backgrounds and touched up menus. Although the music is the same stuff to what you would hear in the TurboGrafx-16 game, it too has been remixed exclusively for the Playstation complete with different tracks for each side's turn and it also has that cool final mission music too. The sound effects are also well done because you'll hear the difference between a foot soldier and their tiny shots and an aircraft's killer missiles. The Playstation version of Nectaris isn't perfect though because the new storyline cinemas are really poorly done in the game because the characters seem so bored despite being in a huge war where their very survival is at stake. I recommend that the cut scenes should be skipped altogether. Another thing wrong with this game is the lack of a defunct two player mode like the one found in the TurboGrafx-16 version so your friend has to sit this one out. You can still play as the green team here but two human players can not fight against one another in a strange move. Not only is this game an excellent example of a deep war simulation, it’s also fairly hard to come by too so Nectaris may be a collector's item in the future. It takes about an hour or two to learn, and it's hard to play the same game once thanks to the random damage, like a HUNTER party can totally wipe out a FALCON party or vice versa, so the game can be very hard to predict at times. It's cool to see if you can do better after you finish the game by trying a new strategy the next time. I still play the game now and again, and I usually play Military Madness for hours on end. Nectaris is a real diamond in the rough that’s very addictive. The Turbografx-16 version of Military Madness features 32 levels and decent 2D and some minor Mode 7 graphics plus some of the sounds are surprisingly not too different then the Playstation game here. This rare game also has a build it manual to help get the basics down just in case you can't get a hold of the original instructions and the game even has a cool two player mode as well. You can save your progress with a password system.